Congress has long avoided comprehensive reform of U.S. development cooperation, and 2014 will likely be no different. But there’s a good chance lawmakers will consider a number of issues that could affect international development. Things will get off to a fast and early start as Congress seeks to hammer out spending bills — including for U.S. foreign assistance — before Jan. 15. Could 2014 be the year Congress decides to update decades-old U.S. food aid policy? The U.S. system for delivering emergency and humanitarian food aid to countries in crisis is legally intertwined with the nation’s agriculture policy and legislated in five-year authorizations known as the farm bill. That means U.S. agriculture and shipping interests have outsized influence over the way emergency food relief programs are delivered. Many development experts and humanitarian aid implementers have called for the re-examination of U.S. food aid policy, to give relief programs more flexibility to purchase food commodities in local and regional markets close to emergency situations. They are currently required to purchase mostly U.S. commodities and ship them overseas on U.S. vessels, a roundabout process that adds time and expense to emergency aid and distorts food markets abroad. Farm bill conference committee negotiations have dragged on since November and a new bill could emerge early in 2014. Observers are optimistic that some measure of food aid reform, however modest, could be part of that package. “Energy poverty” emerged as a high-profile issue for U.S. foreign aid in 2013, after President Barack Obama launched his Power Africa initiative during a visit to three African countries and Rep. Ed Royce introduced the Electrify Africa Act in June. Electrify Africa would lend congressional support to the African energy poverty reduction effort, by granting the administration with clearance to coordinate action and resources across various deal-making agencies, and potentially by granting the Overseas Private Investment Corp. — the U.S. agency that offers debt financing for development projects — greater flexibility in terms of its investments. Advocates are hopeful Electrify Africa’s bipartisan support will usher it through the halls of Congress this year. The Foreign Aid Transparency and Accountability Act failed by one vote in the last Congress. Aid experts are hoping 2014 is the year to finish the job on a piece of legislation that would make law an Obama administration vow to open data troves and require more transparent and systematic evaluation of foreign aid programs. There is still no indication of when a vote could take place, but supporters are more confident that this time around they’ve got the votes. A highly touted and high-level effort is under way to merge two USAID offices — the Office of Science and Technology and the Office of Innovation and Development Alliances — to make it easier for the agency and its partners to procure science and technology expertise and partner with social entrepreneurs. Initially, some experts thought the agency would require some kind of congressional authorization to complete the internal merger and reorganization, but USAID is permitted to open, close and change offices as the agency sees fit. On top of that, the Obama administration has been wary of proposing any foreign aid reforms that require congressional authorization, given the hawkish opposition such reforms tend to provoke. If USAID is looking for some kind of minor congressional approval to complete its planned reorganization, the administration will likely ask Congress to make the change within a comprehensive omnibus bill to fund the entire U.S. government before Jan. 15. Congress has a hard time passing trade agreements and related legislation, and that won’t change in 2014 — with some notable exceptions. This week, leaders of the House Ways and Means Committee as well as the Senate Finance Committee are expected to introduce legislation that lays out negotiating objectives for U.S. trade agreements and gives the executive branch authority to fast-track congressional approval. The trade promotion authority bill is expected to extend the strengthened focus on labor rights that the United States adopted in 2007, and lawmakers may even try to attach an update of the Generalized System of Preferences, the program under which the U.S. government unilaterally lowers tariffs on imports from developing countries. GSP expired in July. Other than that, we may see agreement on the Trans-Pacific Partnership between the United States, Canada and 10 countries in Asia and the Pacific which was meant to be completed at the end of last year. It is expected to include more stringent environmental standards than those under GSP, and similarly strong labor standards. Vietnam and Malaysia are the largest countries covered under this agreement which don’t currently have a trade agreement with the United States. Even if negotiations are successful, though, it could take a while for Congress to muster the energy to ratify the deal. Sub-Saharan Africa’s exports of products covered by the African Growth and Opportunity Act have more than quadrupled since 2001, totaling $35 billion in 2012. But with AGOA set to expire in 2015, the debate among policymakers and within the development community about how to better the act is heating up, although legislation will not emerge until next year. AGOA, signed into law by President Clinton in May 2000, sits at the center of U.S.-Africa trade relations with the objective of allowing eligible sub-Saharan African countries to export thousands of product types to the United States duty-free. U.S. Trade Representative Mike Froman has launched an extensive public review, and President Obama has stated that he not only wants to see AGOA reauthorized, but also that he wants to improve it. Worry lingers that the reauthorization will be delayed, such as when an eleventh-hour renewal in third-country fabric provision last year caused apparel trade to plummet. Observers have also noted that the United States should take a harder look at how agricultural subsidies offered at home affect these trade preferences to Africa. Reports show that many of the 39 countries currently eligible for AGOA aren’t making full use of the act’s preferences, so whether it needs to or will be expanded to cover more products, such as sugar and cotton, remains to be seen. 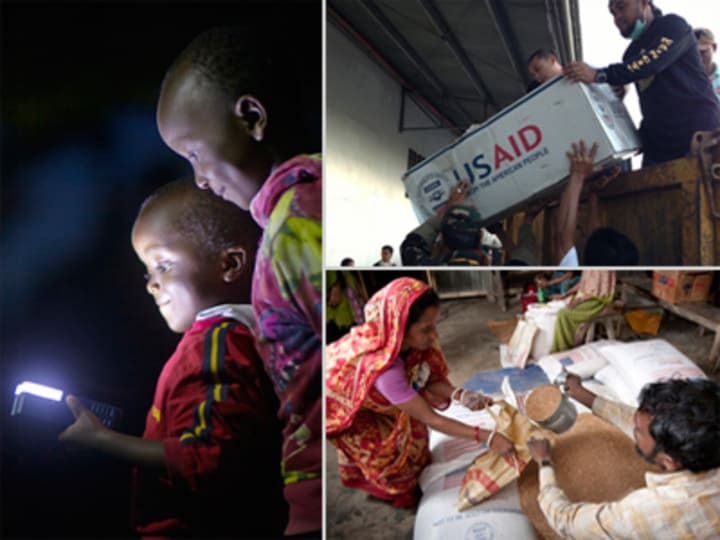 USAID leaders have made it clear that future spending on foreign aid will increasingly be directed to fragile, conflict and disaster-prone states where many of the world’s extreme poor reside and struggle to find opportunities to climb out of poverty. With crises emerging — or persisting — in Syria, the Central African Republic, South Sudan and elsewhere, the administration may call on Congress to authorize response measures as needed. Disaster response efforts typically belie forward-looking budgets. Still, it will be interesting to note whether congressionally authorized humanitarian spending funnels more resources toward “building resilience,” as agency leaders say they have attempted to do in the wake of the Philippine’s Typhoon Haiyan, in hopes such programs could stem what appears to be a rising tide of countries in crisis — both man-made and not. When he left Congress just over a year ago, then-Rep. Howard Berman, a California Democrat, released his latest proposal to overhaul the U.S. Foreign Assistance Act of 1961, the document which created the U.S. Agency for International Development and which has served as the blueprint for U.S. foreign assistance ever since. At the time, aid experts hoped Berman’s initiative would jump-start an effort on Capitol Hill to pass a new foreign aid bill — one that reflects such altered geopolitical contexts as the collapse of the Soviet Union and the advent of the Internet. Most insiders think the chance of moving a new foreign assistance act through the current U.S. Congress is effectively zero. Rolf Rosenkranz and Kelli Rogers contributed reporting.